Why is Bitcoin good for online poker? 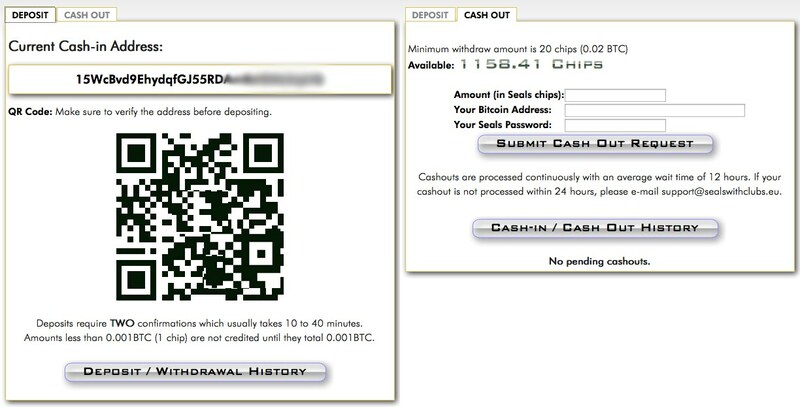 Bitcoins are easy to move around, and you can play online poker with bitcoins. This makes playing online poker for money easy, especially if you're in a country that makes depositing and withdrawing your money difficult. Here are three good things about Bitcoin that make it good for playing poker online. 1. Nobody can control the Bitcoin currency. There are no banks or governments sitting on top of the Bitcoin currency. Note: Think of Bitcoin as open-source money. It is on GitHub afterall. Want to buy a pizza online? Well of course you can young man! I hope you enjoy your pizza as much as you enjoy our digital payment processing! Want to send your money to another country? I think that should be okay, just pay this fee and give me about a week and it should go through. Give us a call if it's not processed in 7-10 working days and we'll see if we can help you. Don't forget to use the correct IBAN and SWIFTBIC code by the way. I know you've never heard of them but you can find them on the paper statements we stopped sending out three years ago. Want to play poker? Hmmm, no. We don't process that kind of nonsense, you naughty boy. I'll just go ahead and make a note of this indecent request on your account for future reference. Thanks for banking with us! Want to buy a pizza online? No probs. Want to send your money to another country? No probs. Want to play poker? No probs. You don't need to ask anyone's permission when you're paying for things in bitcoin. Bitcoin doesn't care. Bitcoin is the honey badger of money. All Bitcoin wants to do is get the job done and make sure everyone agrees. It's a technology that we're all free to use, and using it gives you freedom. Here's the original honey badger if you've not seen it before. Not 100% my humour but I can see why it's popular. 2. Instant deposits and withdrawals. Well, not literally instant, but it's close enough, and I want to keep these headings exciting. With USD (and other fiat currencies) you need someone to process payments for you. This might be a credit card company, or a money transfer service like WesternUnion. Either way, these guys charge fees and they're in control of your money whist they move it. And if someone's in control of your money, they can hold on to it and cause delays. With Bitcoin, payments are processed using technology. There's no company in the middle holding on to your money whilst you move it; it's in the hands of the network instead. With Bitcoin you're trusting technology, not companies. Note: The Bitcoin technology is based upon cryptography. The speed of poker deposits and withdrawals at the moment. Deposits can be made in 10 minutes, but right now most bitcoin poker sites prefer to wait for 2+ "confirmations" (about 20 minutes). This ensures the payment has cleared, even though in most cases 1 confirmation (10 minutes) is a long enough. Withdrawals could take 10 minutes too, but they're a few hours at the moment. Poker rooms haven't automated withdrawals yet, so they're still being verified manually as a matter of safety. This is the only possible point of failure about the withdrawal process, but that just makes it the same as every other online poker room. Nonetheless you can still expect to receive your bitcoins the same day you withdraw them. Remember, it's still early days. Enjoy the fact that this system is actually working right now. This is what the SealsWithClubs cashier looks like. This is how simple depositing and withdrawing money is. 3. Bitcoin doesn't have any problems with the UIGEA. What's that? Only a small number of poker rooms accept US players? That's the UIGEA for you – making it difficult for US citizens to move their dollars to online poker rooms. 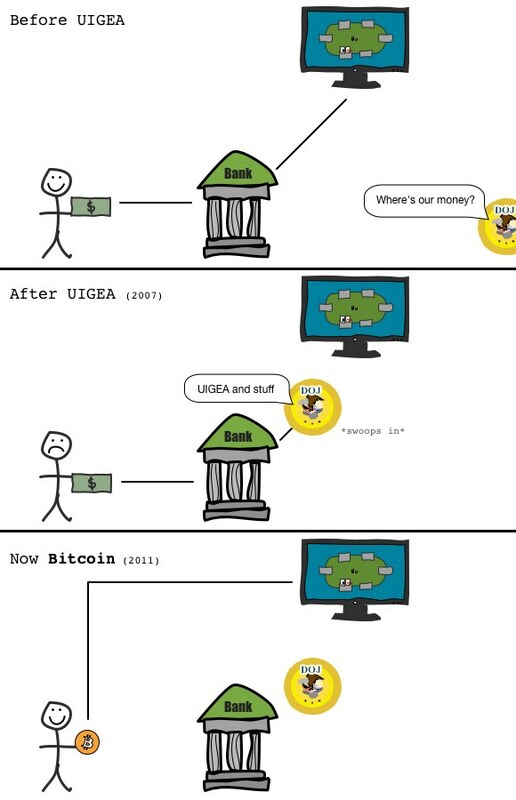 The UIGEA doesn't make online poker illegal, it simply makes it awkward to get your money to an online poker room. That's why US-facing poker rooms are always looking for ways to process payments, and that's why it can be a hassle getting money in and out of your account. This is how online poker in the US works. This is also as good as my digital drawing skills get at the moment. *Bitcoin has been around since 2009, but the first Bitcoin poker room came out in 2011. The UIGEA is basically a restriction on your money, not on online poker. Why? Because if you're moving money around freely there's a chance that the US government is going to miss out on extra tax. Seeing as the government could be losing revenue to overseas online poker rooms, they restrict the flow of money. Works like a charm, except that you miss out on playing poker like everyone else can. We have to use banks to send money, and banks can be told what to do by the government. That's the problem we've got at the moment. But the good thing about Bitcoin is that there's no central body (like a bank) that can be told what to do, and in turn tell you what you can't do with your money. Bitcoin is money that can't be interfered with, and that makes it a handy tool when you've got a government that likes to interfere with your choice to play poker. Bitcoin is a risk. I really like it, but I can't pretend it's not the riskiest thing I've ever mentioned on this site.